Note: The noise mentioned here and the harmonics mentioned here are sometimes thought of as interchangeable. This is because both of them affect other electrical equipment. Generally, however, the harmonics commonly refer to waves with a frequency between 40th and 50th (2.4 to 3kHz) whereas noise commonly refers to waves with a frequency of tens of kilohertz or higher. This noise is generated by a variable frequency drive and radiated to the air. The paths of this noise can be classified into the following three types. Radiated from variable frequency drive. Radiated from motor connection cables. This noise is generated and transmitted when power cables or signal cables of peripheral devices cross a magnetic field generated by the current that is input to or output from a variable frequency drive. This noise is combined capacitances that are generated by the principle of electrostatic induction and transmitted through I/O cables of a variable frequency drive. This noise is a high-frequency noise that is generated inside the variable frequency drive and transmitted to peripheral devices through cables on the power supply side. These noises tend to gain the lower noise level as the noise frequency band is higher. Generally, the noise level is low enough not to be problematic in frequencies of 30MHz or higher. An effective method is to install a filter between a variable frequency drive and the power supply cable. Combination of radio noise filter and line noise filter. 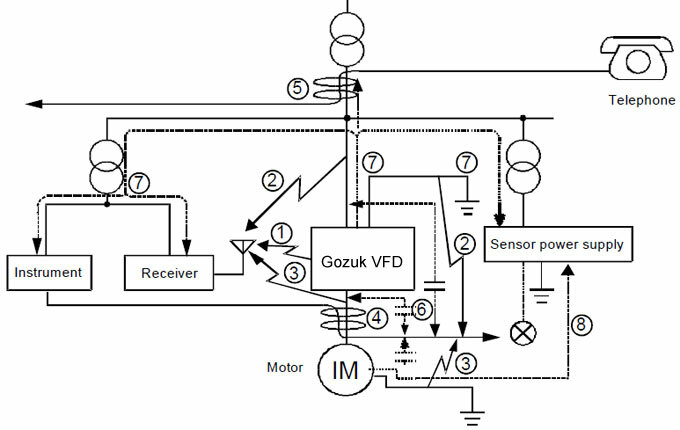 b) Reducing noises radiated from cables between a variable frequency drive and motors. Installing the radio noise filter or line noise filter to the output side of the variable frequency drive is a method to reduce the radiated noises. Generally, however, a metal pipe is used. 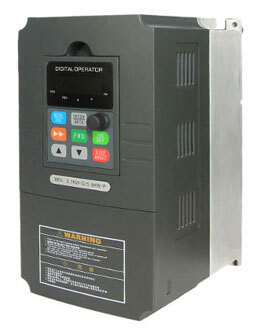 Noises generated from this variable frequency drive are relatively small and less problematic. However, when a variable frequency drive is installed close to devices easily affected by noises, it is required to house the variable frequency drive in a metal case and install a noise filter on the power supply side. Also, for the output side, connect a metal pipe to the case.